Energy efficiency enhancements within the National Construction Code have targeted the reduction of heating and cooling energy required to maintain accepted levels of thermal comfort with new housing. A mixture of market demand and further enhancements to the thermal performance regulations will further increase thermal comfort expectations within new houses in Australia's diverse range of climate types. However, many of these warmer homes are presenting new problems. 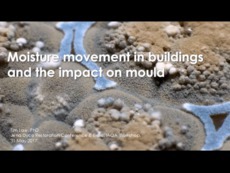 The appearance of condensation and mould within homes, some within four weeks of occupation, is showing a general lack of awareness of vapour pressure management within the Australian design and construction industries. The presentation covers the illnesses related to mould exposure, the legalities of occupying an unhealthy premise, and common building faults that result in mould becoming someone's problem and nobody's business.